The WB21X5243 is a replacement switch that is being used to replace many other surface switches, the trouble is it doesn't look like many of the switches that it is replacing and has different wire numbers and connections. Acrobat reader is required to view the link here for wiring help with this switch. This surface unit switch kit comes complete with full instructions and adapters so you can use the original knob. Voltage rated switch for both small and large units. 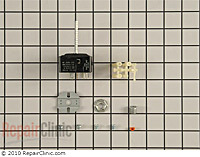 This switch kit will replace most older rotary switches (push-to-turn and free-turn styles). It has 5 terminals, hardware and an adjustable shaft (notched so it can replace many different shaft lengths).